With the rapid rise in BYOD, your employees are bringing their own devices - and potentially a variety of liability issues - to work. Don’t wait until you’re facing a lawsuit to get up to speed on the legal issues associated with BYOD. 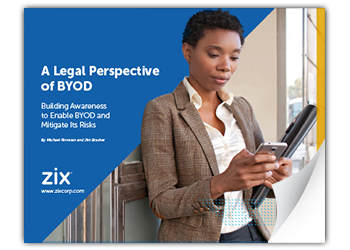 This eBook introduces a variety of prevalent BYOD-related legal issues, assesses their impact, and shares solutions regarding mobility policies.